I finished the race in 7th place overall in a time of 07:38:09, smashing all my pre-race objectives and taking 1 hour 14 minutes off my previous best time for the course. While a great result, I personally don’t believe it was a well executed race. I pushed too hard early on and then spent the majority of the rest of the race fighting my mental demons and waiting for the wheels to come off. Despite feeling like I was hanging on and moving slowly, I was in fact constantly gaining time against my pace card on the majority of the legs. 30-40km and 50-60km were the real mental low points for me in this race. During both of these I was running alone and subsequently hooked up with other runners which lifted my mood. From around 60km I pushed on with Chris Seymour through to the end, thanks for the company Chris, it really helped my spirits! No return of the nauseousness and blood pressure issues from my last race at the end. Not sure I got my nutrition spot on though as was hungry before CP2 and couldn’t get food down so easily do to raised effort levels in places. So a great result but not exactly the execution I’d planned. For those that would like to know more read on. I’d had a pretty good build up training wise. Not quite the awesome 12 week block I’d managed back in the summer prior to The Cumbria Way Ultra, but a good block none the less. Off the back of my last race I’d taken a month of any serious training or mileage, starting to build back up from mid November onwards. With a easier period over Christmas and final peak in the new year this resulted in a good 7 or 8 week block which rolled into my usual 3 week taper. My training diary showed that I was fitter now than I was this time last year and all in all I felt pretty good going into the race. This was by no means an A race for me but would be a good test of my fitness to allow me to plan my training for the year ahead. Weather was going to play an enormous part, with storms dumping loads of rain on the country in the last few months, making the ground heavy going in places. Both Breckland and West Norfolk are quite sandy though, so I was hopeful they would drain well and the course wouldn’t be too muddy. Shoe choice would be critical though. In the end I opted to go with my trusted Brooks Cascadia’s rather than more heavy duty trail shoes. My logic was that the ground shouldn’t be too bad and that I would benefit from these shoes on the long stretches of road between Watton and Swaffham and again either side of Castle Acre. As it turned out my assumption was correct and the Cascadia’s were the perfect choice for the day, for me. The one blip on this plan was that after my penultimate easy run on the Monday I discovered my current pair of Cascadia’s had split! I’d put around 500km into them, which is usually the point I consider swapping them out but had hoped they would be okay for the race first. Closer examination showed there was no way I could race with them as the split could go all the way through. I needed a plan but what to do? I discounted switching to my heavier trail shoes for the reason outlined above and quickly drafted in a new pair of Cascadia’s. A couple of days walking around in them and a final 5km run soon packed around 30km into them and I was confident they would be OK for the weekend. Last year I’d run the Peddars Way Ultra in a brand new pair of Cascadia’s from Castle Acre onwards, so surely they would be fine? As the week went on I was starting to feel quite nervous. I was obviously putting myself under a lot of pressure to get my personal A goal of 8 hours for the race. I’d already mentioned this in my pre-race thoughts on this website, which turned the screws a little more, because if I failed it would be a public failure! As is always the case, the weekend before our two boys went down with heavy colds and I was certain I’d catch it and start this race feeling just like I did my last one. Vitamins, fresh fruit and vegetables were being packed down like they were going out of fashion and by Thursday I gave a sigh of relief as I seemed to be home dry. Of course in typical fashion come Friday morning and I woke with that cold sensation building in my sinuses and head. Dam! More vitamins were applied plus nasal rinses to try and clear it. Surely I can’t get ill the day before the race! I took the opportunity of a day off on the Friday to get my kit sorted. The weather looked good for the next day, so I decided to approach the race fairly light but not super light. 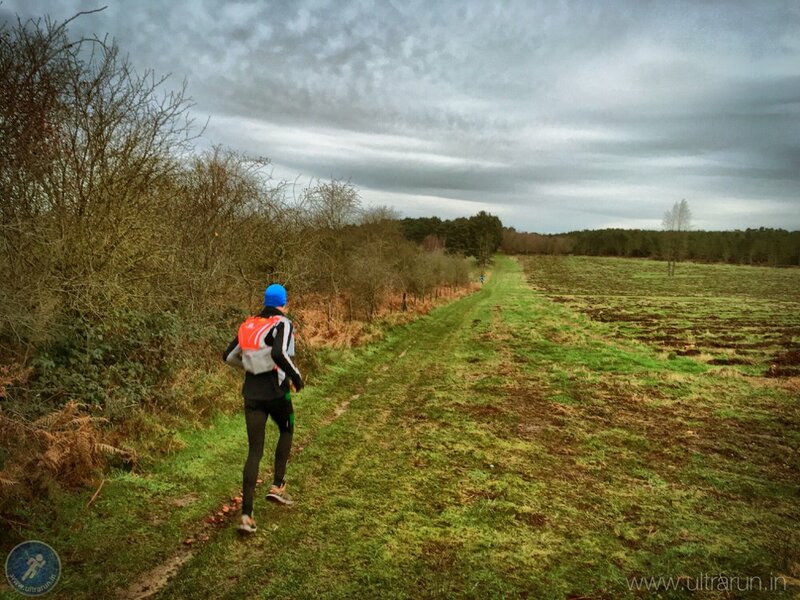 I opted to run with my larger Salomon S-Lab vest for a couple of reasons. Firstly while I had no plans to carry that much stuff, the extra capacity made it easier to get things in and out of it while running. Secondly, and a little sentimentally, this was the vest I wore on both the Hardmoors 55 and Cumbria Way Ultra last year. Personally speaking these were my two best races in 2015 and I hoped a little luck may rub off by using this vest. Me superstitious? Never! As with The Norfolk 100, I travelled over to Watton the night before and stayed with my parents, with my Dad kindly offering to drive me to the start the following morning. In last years race, I’d driven up to the coast the morning of the race to catch the bus back to the start. I didn’t fancy repeating this trip and the option of a night in my old bedroom seemed much more welcoming. We travelled over to Norfolk on the Friday evening, caught up with my family and after a little last minute kit fiddling was in bed by 10:30pm. Roll on race day! First let me quickly outline what my race plan was going into the day, as this will play a key feature in how the race went and my feelings about it both during and after the race. I outlined my race objectives in the week running up to the race and while I was pretty low key about a sub eight hour finish, I genuinely thought I had it in me to sneak just under eight hours if everything went according to plan. We’d also learnt that the board walks shortly after the start of the race start were partially flooded in places and that, combined with the fact there would be around 140 people racing that weekend, meant I was keen to get off the line quickly to avoid the queues that could possibly form in this area. At CP1 access how I was feeling and if OK up the effort slightly, if in doubt then continue at same pace to checkpoint 2 at Castle Acre. So pretty straight forward really. Sprint to the first corner (kind of) and then ease right back building slowly for a barn storming finish. Sensible plan right? What could possibly go wrong!? The alarm went off at 05:15 and I was straight into my normal pre-race breakfast of rice pudding, custard, banana and coconut water. I quickly got dressed and checked and re-checked my kit. The weather showed some potential for rain, so I decided to wear contact lens instead of glasses just in case. We were out the door just after 06:30 as planned and on the road, via Tesco for one final precautionary loo break of course! Knettishall Heath wasn’t too busy and I was quickly through registration, saying hi to Kevin Marshall and the Team as the buses arrived bringing runners from the finish on the North Norfolk Coast. I mooched around some more, meeting up with other friends including John and Karen who I’d run Norfolk 100 with last June. I also met up with Richard and Natalie. Richard had ran The Spine race with a mutual friend a few weeks before. 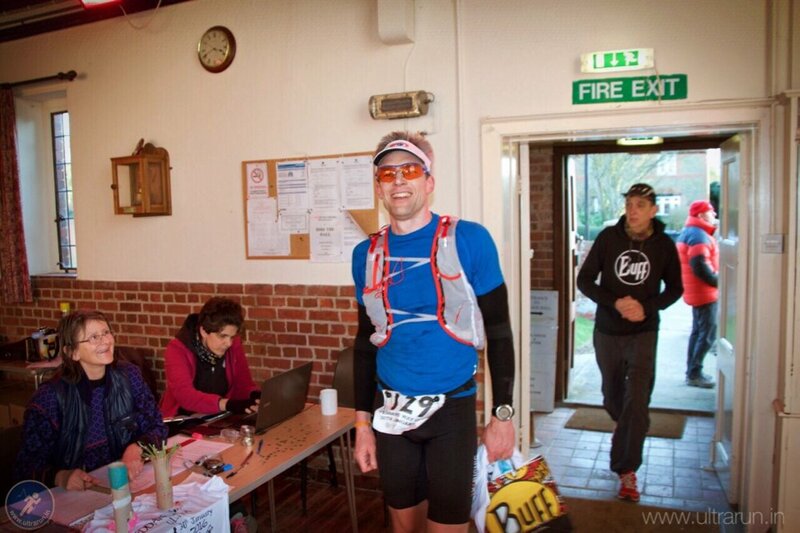 Extremely impressive to see Richard lining up for the start of another ultra so soon after The Spine! It wasn’t as cold as last year but I was still keen to get going, suffering with some nerves and also feeling full of running energy. Hopefully that was the taper doing its job! Before we knew it Kevin was delivering the race briefing. It turned out the boardwalks were actually three miles away and not one mile as I’d previously thought. Oh well, I’ve got plenty of energy to burn and nothing like a good brisk run to warm the muscles up! Before we knew it the briefing was over and we quickly moved towards the start and we were off! I was keen to get away quickly and did, leading the group for the first hundred metres or so before the faster runners started to pass. By the time we hit the start of the Peddars Way proper I was still in third place but eased back as I realised I was not only going too quick but that I was now probably far enough ahead to be able to avoid significant hold ups once we got to the boardwalks. Other runners came past one by one, including Richard who skipped past me showing no ill effects from The Spine a few weeks earlier. I wished him luck and he assured me I’d catch him later, unlikely I thought as he disappeared off into the distance. Kyle, a club mate from Ely Tri Club, was now running behind me and pulled alongside to chat as we went through the first mile. This was his first ultra and he was looking forward to the race. I checked my watch and my heart rate was into the 150’s, higher than I would hope for the long haul but not uncomfortably so at this stage, so I kept moving forward confident it would ease back once I’d settled into the run. My legs felt good and generally I felt ok, it was just great to be running after the nervous anticipation of the last week or so. We arrived at the boardwalks, which were flooded but not badly. Kyle slowed to a standstill half way through the first flood, obviously considering tip toeing along the wood on the edge to avoid getting wet feet. I politely pointed out that he should just man up and get wet feet, especially as I’d now had to stop right behind him and was getting wet feet myself. Sorry Kyle! We quickly moved on and were soon through the boardwalks and heading north towards across heathland and fields towards the A11. As I wrote earlier, my plan at this point was for me to ease the pace back. While I did a little, I was still running with my heart rate around 150bpm. I considered pulling back more but as I felt ok and the other runners around we were gently pulling away, I decided to hold the pace where it was and see how things went. It was a lovely morning, cool but no way near as cold as the previous years race. I’d planned to start the race in a thin merino wool top and arm warmers but as it was quite nippy at the start I’d added a windproof gilet as well. Now I was running I didn’t need it, so as we hit a slight incline I slowed my pace slightly, removed the gilet and stowed it in my race vest. There were quite a few trees and branches down from the storms of recent weeks and the high winds of the last few days. I’d forgotten how much ducking and diving was needed as we weaved our way through the woodland and hedgerows over the first few miles. This year there were a few obstacles that also had to be jumped over and it felt more like a Steeplechase at time. Not ideal terrain for someone over 6ft but a fun way to start the race all the same. As the land opened out I also took the opportunity to stop and grab a few photos. As always its a great way to allow the heart rate to settle but even with this I was still hovering around 150bpm but still felt ok so continued as I was, it is a race after all! I was also conscious that last year I was behind schedule from the word go, so was keen to try and get some time in the bank by Watton and checkpoint 1, which I could use later in the race. Just like last year, running this section was a trip down memory lane, going past landmarks and places that were familiar from my childhood. 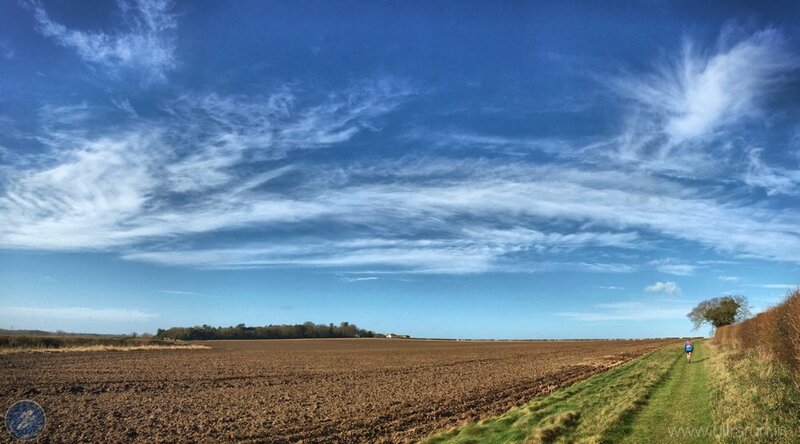 This year I had the added benefit that I had run the entire route before, twice for the northern section beyond Castle Acre, as this is also the first part of The Norfolk 100. As such it was easy to mentally tick off my progress along the route as I ran. Before long we were crossing the A11 and moving way from Thetford Forest. Wretham arrived soon after and the first road section of the day up towards Thompson. Checking my watch I could see that I was well ahead of 8:20 pace and was in fact currently on 8 hour pace, my target time! This was great but I was also worried that maybe I was pushing too hard too early in the race. I did a quick check and felt OK(ish) so decided to continue as I was. We passed a number of supporters and marshals as we ran, all shouting encouragement, as they all did throughout the day and was very much appreciated. By now I was running on my own, with a few runners just in view a few hundred metres ahead and some more a similar distance behind. As we approached the end of the road section I could see the florescent hat of one runner disappearing off to the right onto the Pingo Trail. I prepared myself to shout a warning as I got closer but saw that they’d already realised their mistake and were turning back towards the road. We converged together back on the road and another two runners, one of which was Kyle, also appeared from the Pingo Trail. They had mistaken the right hand junction for the right fork which was another hundred metres down the road. No real harm done and we all joined the rutted farm track as a group of five. We ran alongside the Stanford training area, with the noise of gun fire in the distance. We weaved our way around the huge puddles which are typical on this stretch of the Peddars Way, created by farm traffic and cars heading to Thompson Water. We were soon back onto bridleway and the surface returned to sandy mud. As we entered the final few miles before the first checkpoint the sun came out, and I once again stopped to grab a few photos. The group pulled ahead and I ran on behind them, happy to let them lead the way into the checkpoint. I was starting to feel a little tired now and I wondered whether I’d miscalculated and gone out too hard. The checkpoint wasn’t far, hopefully that will allow my body to settle and it will feel fine after that? I was slowly gaining on the others but as we ran down the muddy lane before the final climb up to the Watton checkpoint I decided to stop and grab a quick comfort break. Rather than be the fifth of a group of five runners to arrive at the checkpoint, I figured a quick stop would allow the checkpoint staff time to sort the others bottles before I arrived, therefore minimising my time in the checkpoint. I was soon over the hill and running in towards the team, with Kevin Marshall cheering me in. Like the spectators on the course the checkpoint and race team were superb throughout and there enthusiasm and support was really appreciated, thanks all! As I approached the checkpoint I had already loaded my now empty water flasks with Nuun tablets, so it was simply a case of passing them to a ready pair of hands who quickly filled them with water for me. I was craving some salty food but the only option appeared to be crisps. I grabbed some and quickly drank two cups of coke and another two of water while munching a handful of crisps. It was starting to rain and I was keen to keep moving, conscious of one of my other pre-race objectives, to minimise my time in checkpoints and keep moving forward. So I grabbed half a banana, called my thanks to the team and was on my way out of the checkpoint. My GPS tracking showed that I only spent 1:57 in the Watton checkpoint, the first PR of the day! I was also now 24 minutes ahead of my 8:20 pace card, which also put me 4 minutes ahead of 8 hour pace. But had I pushed too hard too soon? As soon as I started to moving I didn’t feel quite right. The lethargy that had slowly been building in the last few miles was still there and I also now felt like I had heavy legs. Maybe it was the drop in temperature and spitting rain? Maybe I had pushed too hard on the first leg and this was the start of the wheels coming off? Whatever it was, the demons started whispering in my head. I walked for a while as I ate the half banana I’d taken with me from the checkpoint. Kyle was still in the checkpoint as I left and the rest of the group were running away from me up the field. I finished my banana, checked over my shoulder and saw Kyle a hundred metres or so behind me. He’d been running strong on the previous leg so expected him to quickly catch me up. Time to get running, no use dwelling on the negatives. Continuous forward momentum was key. The coast wasn’t going to appear by itself! And with that I broke into a run. Despite the rain I’d decided not to pull on a jacket, as the weather was forecast to improve as the day went on. I took a chance it would quickly pass and thankfully it soon did. The temperature had noticeably dropped though, again as forecast for around 10am, so I reached around into my vest and pulled on my gloves to take the edge off my hands. I felt a little better once I was running and was soon at Little Cressingham and the start of the next road section onto and beyond North Pickenham. There were a number of supporters here, including Richards wife who cheered us all through. Richard was still going strongly but his wife was confident I’d soon catch him. I was less sure the way I was feeling but smiled and pushed on. As I ran down the hill I tried to pull out the positives. I was well up on my last years time, my 8:20 pace card and was even inside 8 hour pace. My quads weren’t shot, as they had been last year and despite feeling rough I was still running. Hopefully this was just a low point and I knew I’d had these before in other races and had come out the other side. Fingers crossed that would happen here too and quickly. My parents had said they’d meet me on the hill out of Cressingham as they had in 2015. I was looking forward to seeing some more friendly faces but was also keen to keep moving. I took my first walk break at the bottom of the hill on its steepest section. If the wheels were about to come off I figured running the steeper bit would accelerate this. Hopefully a walk would delay or avoid it altogether? As the gradient eased back I was once again running, another positive on last year where I’d walked the entire hill! I waved to my parents and exchanged a few words as I passed and told them I was ok. They told me afterwards I looked strong, I felt anything but, a career on the stage obviously beckons for me! I quickly checked over my shoulder and was surprised to see no sign of Kyle. I hoped he was ok, he had seemed fine when I’d run with him before Watton, so just assumed he was taking it easy for a bit. On reading Kyle’s own race report after the event, it turned out that shortly after leaving the checkpoint he’d followed some local runners out for a jog off the Peddars Way for a short while before they pointed him back onto the course. Yet more proof of the Ultra Running Law that you should never assume that those in front know where they’re going! I pushed on over the top of the hill and down towards the South Pickenham road. I was alone once again with my demons! I decided now was the time to break out my iPod and listen to some light hearted podcasts to try and lift my mood and distract my mind. 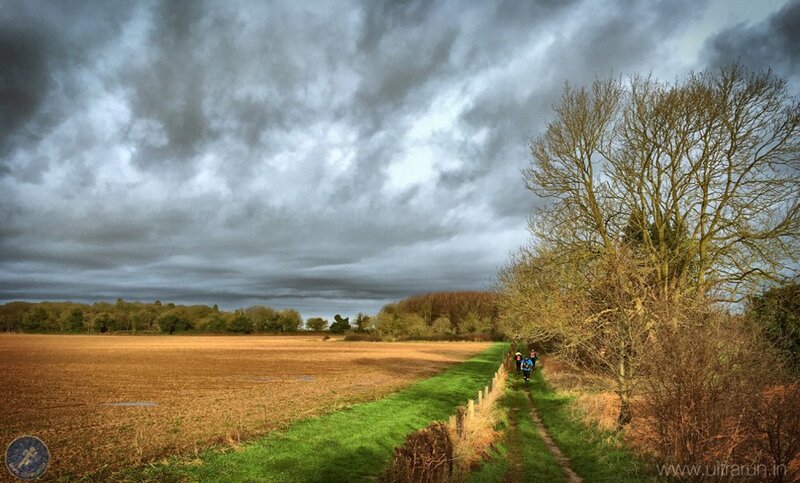 I plugged in and continued running downhill, switching to a walk on uphill drag to North Pickenham. I was starting to feel worse and as I left the road for the meadows at Pickenham I decided to take another short walk break. Strangely it was at this same point last year where I’d really questioned if I could complete the race and had starting walking on the flat. Same geographic location, in a quicker time than last year but once again I was questioning myself. The Pickenham Meadows weren’t anywhere near as muddy as I’d feared and before long I was back on the road heading out of the village towards the Swaffham and the A47. I walked the uphill stretch out of the village. I could see some runners ahead but as I hit the trail once again two runners overtook me from behind. “Here we go, you’re now moving backwards!” the demons cried. I continued to run but my legs were starting to feel sore. Suddenly Richard appeared ahead of me. He was still running but a lot slower than when I last saw him 30 odd kilometres ago. We briefly exchanged words as we passed and he wished me luck. I passed his wife shortly afterwards waiting at the A47 crossing and assured her he was on his way. I would later learn that Richard had stopped here, which was understandable and still an amazing effort considering his efforts a few weeks earlier on The Spine. 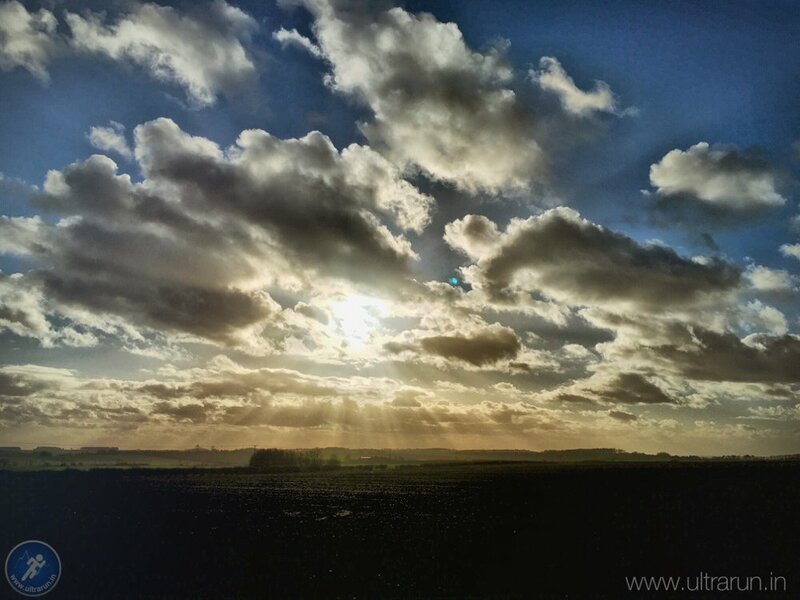 Once over the A47 I was less than 10km away from to the next checkpoint at Castle Acre. The drivethrough at the MacDonalds was doing a roaring trade as I passed the other side of the hedge. Never has one looked so tempting! 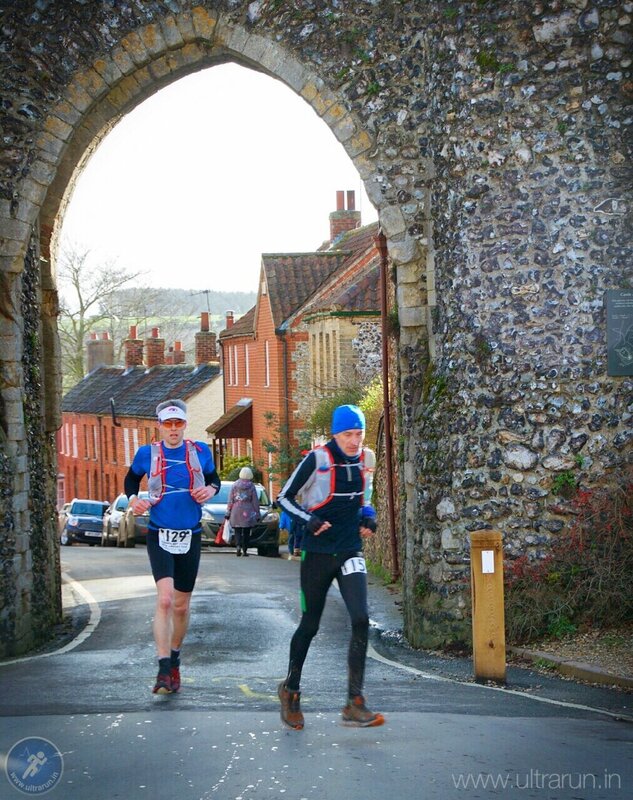 I hadn’t been checking the splits but knew for an 8:20 finish I needed to be out of Castle Acre by 12:30ish. A quick check of the watch and some mental arithmetic showed that at this rate I would be in before noon! Amazingly despite feeling the way I did, I was still gaining time! I was again running alone. I reached the Sporle road where from memory I knew I had to turn right for 100 metres before leaving the road and heading north again. A junction appeared on the left but the Peddars Way sign opposite wasn’t pointing down it and seemed to point further up the road. Surely this was the junction? I looked up the road heading north, recognised it straight away and could also just see two runners disappearing into the distance. To further confirm my decision two other runners appeared running back down the Sporle road. They me obviously had a similar dilemma but had decided to trust the sign before realising their mistake. I crossed the road and pushed on northwards, no time to waste! 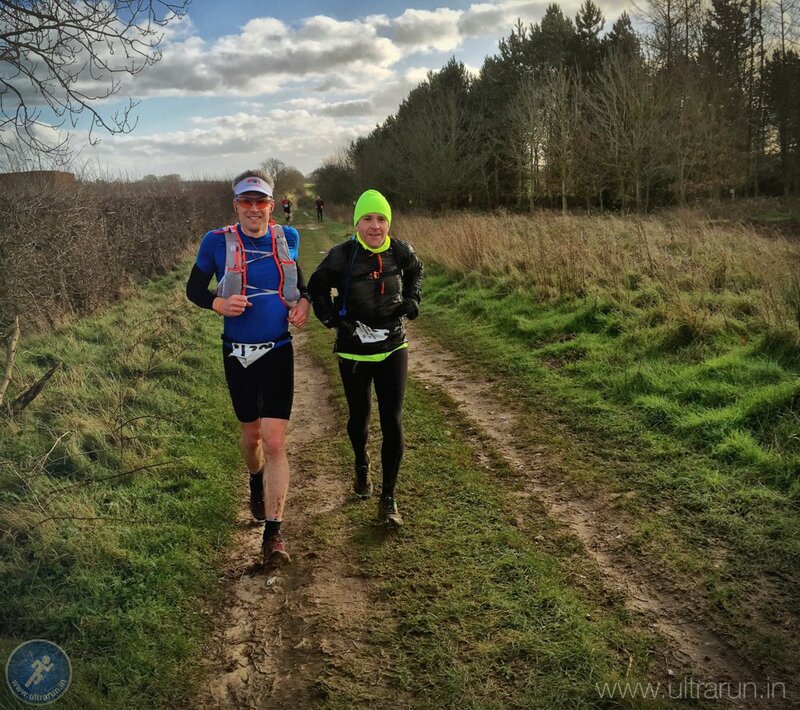 The two lost runners eventually caught me a few kilometres later just before I joined the next road section at Great Palgrave, which would take us all the way to checkpoint 3 at Castle Acre and on northwards after it for 5km towards checkpoint 3. We exchanged words as they passed, it was Chris Seymour and Tim Ellis who’d I’d run with and around for the majority of the first leg. As we hit the road they pulled slightly ahead but I soon caught them as we left the road briefly for a stretch running parallel along a field headland. We were soon back on the road and crossing the A1065. I walked the initial uphill section with Chris and we chatted, discussing our previous races and running plans for the year ahead. Soon Castle Acre came into view and we dropped down, past the ford beneath the Priory ruins before heading up into the village and The Bailey Gate. As we approached the village I began to feel really hungry. I’d been eating while I ran but had not been enjoying it and maybe that had made me back off the food too much. The demons were back! As we finally hit the the street up towards the Bailey Gate Chris and I slowed to a walk and someone called “Hello Giles”. I turned to see my in-laws in a car behind me. They drove past saying they’d see me at the checkpoint and also saying my wife and sons were ahead of them somewhere. Chris snapped us back into action and we broke into a run through the gate and into the centre of the village. There were cheers from the spectators and also the checkpoint team with both Kevin and Ian (Race Directors) giving me loads of encouragement – thanks Gents! We checked in to find we’d completed the first 43km in 3:57. Well over half way in under four hours. I was now 40 minutes up on 8:20 pace and well inside 8 hour pace as well. Despite feeling like I was running poorly and battling my mental demons, I’d still managed to gain an extra 16 minutes in the last leg! I was stunned. How had I managed that? My efforts to keep moving forward were obviously paying off and when I was running I was still moving well and constantly gaining time, even though it didn’t feel like it. Looking back after the race I can see this was one of two sections where I was really low as I took no pictures until the final approach to Castle Acre, a sure sign I’m not enjoying myself. I should have realised at the time that having people around was helping me get out of my negative mindset but it would take another ten miles or so before I would recognise that myself! The first order of business was to get some food inside me and quickly. I headed into the checkpoint to be greeted by the now familiar team of friendly staff. I ordered a sweet tea, my new ultra running drink of choice, and dug into the savoury snacks on offer. While I waited for the tea I got my water flasks refilled and also drank two cups of coke and water. Once I had my tea I found my drop bag and headed outside where I could see my parents and brother waiting. 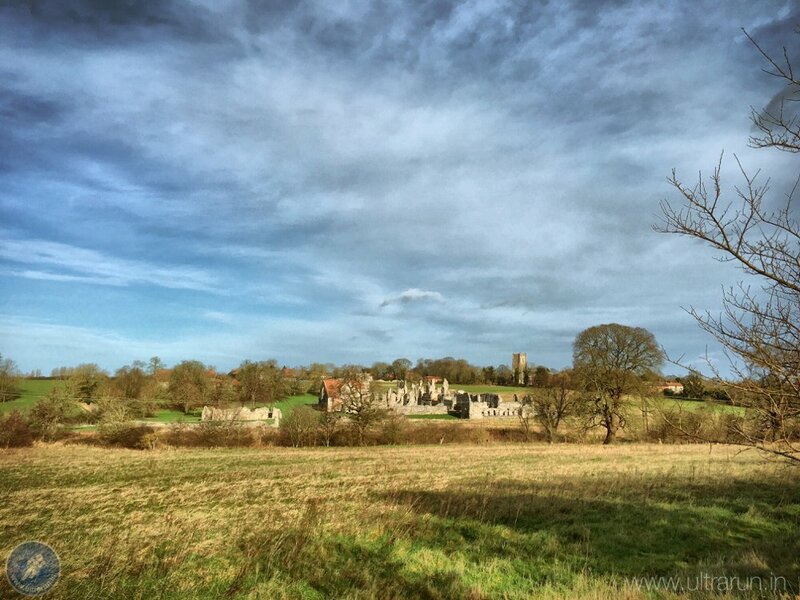 The demons were still whispering and although I was seriously pleased to have made it to Castle Acre well ahead of schedule, I continued to have concerns that things would fall apart in the miles to come. I was therefore keen to get moving as soon as possible. Better to get the miles in the bank while I can before the wheels come totally off I thought! I quickly tucked into a rice pudding from my drop bag and re-loaded by race vest with Nakd Bars and Mini Malt Loaves. I chatted with my family and was soon thinking about leaving. I took the opportunity of the pub toilet for a quick comfort break, and with other runners leaving the checkpoint I readied myself to leave. My eldest son appeared with my in-laws and I quickly hugged and said hello to him. Across the road I could see my youngest son with my wife, so I quickly jogged over there to say hello before heading up the road. My youngest son cried on seeing me, which was a real wrench. I picked him up for a quick hug. He clung onto me and it took a major effort to kiss him and pass him back to his Mum so I could get going. I bade my farewells to my family and apologised for leaving so quickly. I grabbed a banana from the checkpoint staff, gave my thanks to them all and headed off up the road. Checking the stats I spent just 9 minutes in the half way checkpoint, which is an age when compared to the other two stops but still a vast improvement on last year and all my previous ultras. As I left the checkpoint Kevin and Ian cheered me on, Ian pointing out correctly how gorgeous the weather now was. The cloud had cleared and the sun was burning down as I rang along the road, round the corner and started the next short leg to Dogotel and checkpoint 3. I ran with the banana in my hand, thinking I would eat it quickly. There were a couple of other runners around me, some with family in toe and we leap frogged each other as we ran walked towards the edge of the village. Once out of the village we left the road and picked the path up running parallel to it along the field edges. The views were lovely, my iPod was back in but still the demons played in my head. “Have you now eaten too much? You feel so tired? You cannot keep this up?”. I plodded along in my own world, listening to podcasts and trying to ignore the demons and heaviness in my legs. This section would mark the start of another real low point for me during the race, which would stretch beyond the next checkpoint and again demonstrated by a distinct lack of photos for the next ten miles. We rejoined the road and was leap frogging another runner (Javier Rio) as we each took it in turns to take short walk breaks up the hills. I was tired and also keen to try and let my food settle, so was happy not to push it too hard out of the checkpoint. I was now on familiar territory, having run this section twice last year, once in the Peddars Way Ultra and again at the start of the Norfolk 100. Amazingly this was the best weather I’d experienced yet but this didn’t seem to lift my mood. I was running but was still convinced I’d ruined my race by going too hard too soon. I was still carrying the banana I’d taken from the checkpoint in my hand and with no stomach for food I eventually stowed this in my race vest as we left the road and hit the trail again. We were now half way to the next checkpoint and it was good to be off the tarmac, which we wouldn’t spend significant time on again until the last few miles of the race around Ringstead and into the finish itself at Holme. My legs were now really sore and my quads were getting tight, so I took the opportunity to stop and stretch them out. The ground underfoot was as expected, pretty light going generally, with some small heavier patches where the farm traffic had churned it up. I could feel tingling in my fingers and was worrying this was the return of the blood pressure issues I’d experienced at the end of the Cumbria Way Ultra in September 2015. Although the sun was now out I pulled my gloves on again and wiggled my fingers to try and get the circulation going. It seemed to do the trick which was a great relief. I was still running pretty well and caught and passed a few runners as we approached the final checkpoint. Its always a good mental boost to go through the last checkpoint in any race, even if we did have the small matter of a half marathon left to run to the coast. I saw the barns approaching that singled the final few hundred metres into the checkpoint. As I rounded the corner I saw the race banner and my Dad’s car parked beyond, finally arriving into the checkpoint at the head of a small group of runners. My brother was also at the checkpoint with my Dad as I ran in, both commenting I was going extremely well and my even brother suggesting I’d be finished by 3pm at this rate. I soon put him correct on that fact, explaining I felt pretty awful and wasn’t sure I could keep this up. At this stage of the race I wasn’t tracking time and just had in my head that I needed to get to Holme by 4pm if I was going to break the 8 hour barrier. I doubted this would be possible and was convinced I was going slower and slower. Looking back at the data after the race, I did indeed loose 8 minutes in the first half of the leg to this checkpoint, although this was probably as a result of the time I’d spent at the Castle Acre before leaving. By the time I’d made it to Dogotel I’d not only made this back up but had actually found some additional time on and was now 49 minutes up on my 8:20 plan, almost on 7:30 pace! If only I’d known this at the time! I took the opportunity while in the checkpoint to introduce myself to Peter Jay We’d briefly chatted on twitter earlier in the day. Peter had had to drop out due to an injury but had said he would be at Checkpoint 3. He commented later that I’d look really strong as I’d come through, again I’ve obviously missed my calling on the stage! I took on more coke, water and crisps. I had one of my bottles refilled but just with water this time. Other runners had arrived by now, with one runner passing straight through. “Best get this show on the road” I thought. I made my farewells to my family and the checkpoint team, commenting that this was probably going to be the hardest half marathon I’d ever run. I walked down to the main road, waited to cross and was on my way. Immediately after crossing the main road you hit a long drag uphill which I gratefully walked. I passed two runners almost immediately after leaving the checkpoint and could see the runner who ran straight through the checkpoint disappearing up the hill ahead of me. I was waiting for the others who’d been at the checkpoint, who I knew were right behind me, to come past me but they didn’t appear. Stomach wise I was starting to feel a little rough. I ate a Nakd bar to try and get some more calories in as I climbed away from the checkpoint but I was struggling to swallow it down, eventually spitting it out. I drank some water and waited for things to settle. Eventually the gradient eased and I broke into a gentle run, still expecting the runners behind to come flying past me. My podcasts were still playing but my spirits were now rock bottom. At some point during this section I came across a supporter at a road crossing who cheered me across. I thanked her and explained I was struggling, at which point she produced a board with cut fruit and jaffa cakes on it, offering me some. The satsumas looked amazing, and remembering how they’d settled my stomach during the Norfolk 100, I cheekily asked if I could take a couple of pieces. She kindly agreed and wished me luck and on I pushed on, munching the orange nectar. Apologies as I never asked your name but if you’re reading this, then thanks enormously and apologies for being so rude and asking for more. You were a life saver! On I ran, walking the steeper uphills and running the rest, in my own private world of misery. I pulled out the banana I’d carried from Castle Acre and managed to get that down, my stomach now settling as the satsuma pieces did their work, which was a real bonus. The runner ahead had disappeared into the distance but still the runners behind did not appear. I stopped for a short comfort break, expecting them to overtake me but when I started running again they were still a short way back down the track. The sun was still out and getting lower into the afternoon sky, giving some wonderful colours. I took the opportunity to stop and take some photos, at which point Chris Seymour caught me once again from behind and asked if I wanted him to take a photo with me in it. I gratefully accept and as Tim Ellis ran up towards us I jumped beside him telling him to smile. Apologies Tim, I don’t think I ever asked if you wanted to be in the photo or not. We both seemed quite cheerful so hopefully you weren’t too offended? Looking back now I wonder whether subconsciously I wanted others to catch me, so I could run and chat with people. Whether this was the case or not it did wonders for my spirit and I ditched my headphones and ran and chatted with Chris and Tim. Our group of 3 soon became 5 as another couple of runners caught us and we ran on together for a mile or so. This was a real turning point in the race for me and I felt the energy flowing back through me, the demons vanquished to a dark corner of my mind. The company and idle chit chat seemed to lift my spirits and while my legs still felt heavy, I felt comfortable running. After a mile or so Chris and I pulled away from the rest of the group and ran on together. Chris like myself had run the race the previous year, although Chris had had a far better result than I had. We were now well into the final stages of the route, recognising landmarks and ticking off the climbs as they came and went. 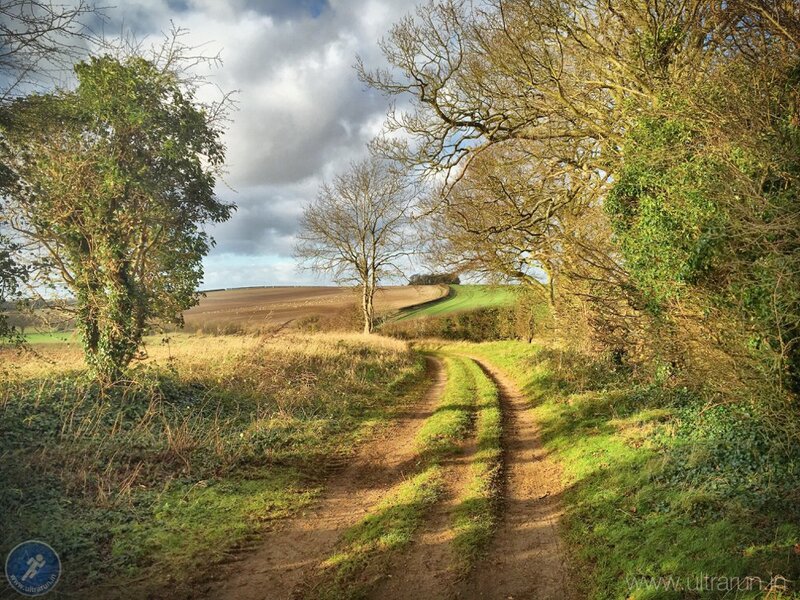 An uphill to the wood just before the Littleport cottages – remember the left hand turn through the hedge. Another uphill ahead of Ringstead before sweeping downhill through the village and up out the other side. The coast would then appear and its all downhill from there! This helped enormously as it gave us something to focus on and we knew the end was just over the horizon. We were still walking the uphills but no sooner did landmarks appear on the horizon we seemed to be running past them. 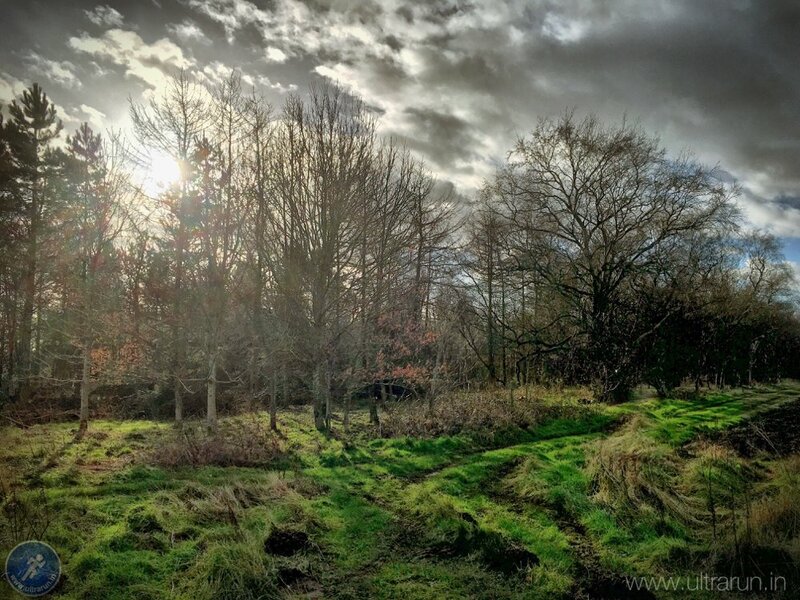 I was back in the grove, a good mental place and was even taking photos again, a good sign! For the first time in a while I checked my watch and it was just before 3pm. A sub 8 hour was well and truly attainable but how far under could we go? We were too far out for a 7:30 but how close could we get? As we left Littleport two runners appeared 400m ahead of us walking up the hill. I could see them constantly checking over their shoulders where we were and I joked to Chris that they were obviously struggling and we could have them before the end. We continued to walk up the hill before Ringstead but as we hit the downhill the two runners ahead had disappeared, so much so I questioned if they’d taken a wrong turn. There were few options for that, so we assumed they’d recovered and were great downhillers, road runners or both and had just bolted to drop us, which they had successfully achieved. Before arriving at Ringstead both Chris and I had commented how the village always seemed to drag on whenever you ran through it. Surprisingly this time it did not and as with all the previous landmarks we were soon heading uphill out of the village towards the windmill and the coast. As we turned the final corner the sea came into view for the first time and we caught a glimpse of the two runners from earlier 400m or so ahead. They were running and it was too far to hope we’d catch them so I mentally settled in for a nice easy run into the finish. As we left the road for the final length of trail down to the coast road we could see them still running well ahead of us. As we made the final turn back to the north I lifted the pace a little, making the most of the final stretch on trail before the return to the tarmac to the finish. We reached the coast road and had to stop momentarily for a passing car. As Chris and I crossed the road and headed down into Holme I saw that the two runners were now only 250m ahead of us. That was catchable! Something inside me clicked and I was off. With a quick shout over my shoulder to Chris that they were right there I lifted the pace and headed towards the beach. Nothing major, as there was still over a mile to go but a sustained effort to try and slowly pull them in. Since the race I have felt a little guilty about this and think I owe Chris an apology. We’d run together for around ten miles and (I hope) enjoyed each others company. Maybe I should have consulted more widely before making that snap decision. Sorry Chris! I was closing slowly on the runners ahead. I felt like I was moving through treacle, although later analysis of the stats showed I was moving at around 4:30/km pace, which is not too shabby after 75km! I was conscious of the distance still to run, plus a short stretch across the sand which would feel like quick sand after the previous few hours running. The last thing I wanted was to over extend myself now, so I was aiming to hold a steady but comfortable pace for now and then look to lift the effort level again once back off the beach. As we approached the beach car park I had closed to within 20 metres of both the runners when they glanced back and stopped running. I was quickly past them with a quick exchange of words and heading onto the beach. Two other runners approached from the opposite direction in quick succession, including Javier Rio who I’d ran with on and off between Castle Acre and the Dogotel checkpoint. They were too far ahead to catch, so now it was just a question of focussing on my time and maintaining the effort level. I hit the golf course in brilliant sunshine, a quick check left and right for golfers and I as out onto the sand heading for the signpost which marked the end of Peddars Way. I ripped the page from the paperback book attached to the post, to take as evidence of my presence at the signpost to the finish back in the village. Unlike last year this was a much simpler affair. Although it was still windy there wasn’t the fading light, driving snow and numb fingers to deal with this time around. I turned about face and headed back across the sand and golf course and into the final mile to the finish. I passed Chris coming onto the course and we exchanged greetings as I pushed on for the finish. There was still a way to go and it was a question of measuring my effort levels to fully empty the tank by the line. The left turn to the village arrived, I took it and was now on the home straight. As I rounded a corner I found Javier on the side of the road putting his jacket into his bag. Why he had stopped with only a few hundred metres to go I don’t know and I felt guilty passing him knowing that in reality the place wasn’t mine to take. He duly sorted the problem by skipping back past me shortly later and as I was now giving it all for the finish there was nothing I could do to respond and followed him home. Ahead I could see the village hall appear and see my Dad standing outside, along with Kevin Marshall and a lots of other supporters. Kevin shouted our numbers into the hall and then cheered me home, greeting me warmly as I arrived at the finish. My family were also all outside cheering me on, including my two sons who followed me in through the door. All I could think about was the time as I dived into the village hall to applause from those inside and to stop the clock. I’d done it, 7th place overall in a time of 7:38:09! As soon as I’d finished I looked for a seat, fearful of a return of the blood pressure issues from my last race. It was unwarranted but it was good to sit down anyway and my family were all there. I grabbed some food but as usual didn’t really feel that hungry. My parents had brought me a pint of milk, which I downed quickly, along with another cup of tea. I changed out of my race kit into some warm dry clothes and enjoyed joining the others to cheer the people I’d been running with over the last seven odd hours into the hall. A particular highlight was the arrival of Karen Doak, who I’d run the Norfolk 100 with. 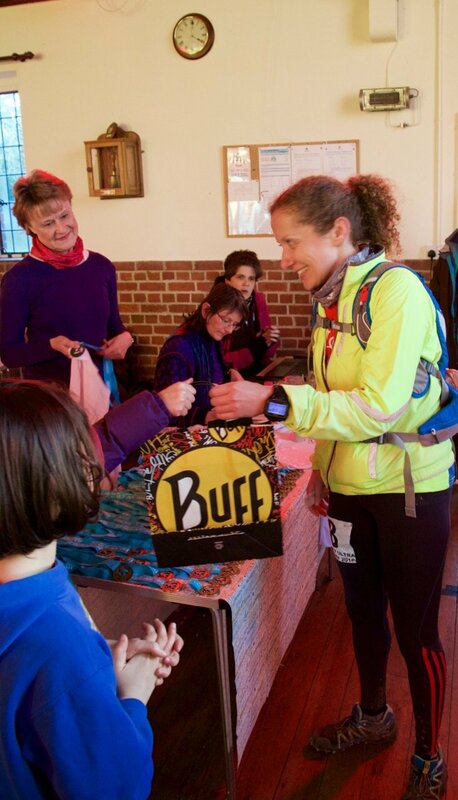 She’d raced to her third consecutive victory at Peddars Way Ultra and a new women course record of 07:59:24. Awesome result Karen, well done! My initial reaction to the race was one of both pride and frustration in equal measure. This is the first time I have really raced an ultra and I’m extremely pleased to have both finished the race and also knocked my pre-race objectives out of the park, taking 1 hour 15 minutes off my previous time for the course. On the other hand I was frustrated with what I felt was a poorly executed race on my part, pushing too hard early on and then letting mental demons take control during long stretches of the race. Having read back through this race report I am concerned it may come across as quite negative. Truth is that is how I felt for large parts of it, even if to others outside it wasn’t apparent. Yes I am extremely pleased with the outcome but the demons tried their hardest to push me off course and nearly had their way! That said its always a positive experience to battle through these lows and still put in a good performance. While I thought I was slowing the data shows I was actually gaining time throughout the race, which is extremely pleasing to see and I need to find a way to easily track this during future races. Yes there were some low points and it was a challenging race, however there are also loads of positives I can take from the race which will hopefully set me up well for the coming season and the races I have coming up, including my first one hundred miler, The Lakeland 100. 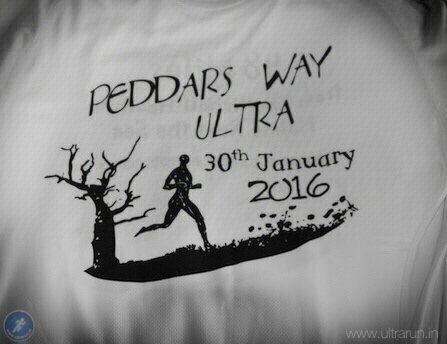 So there we have it, another Peddars Way Ultra in the bag. 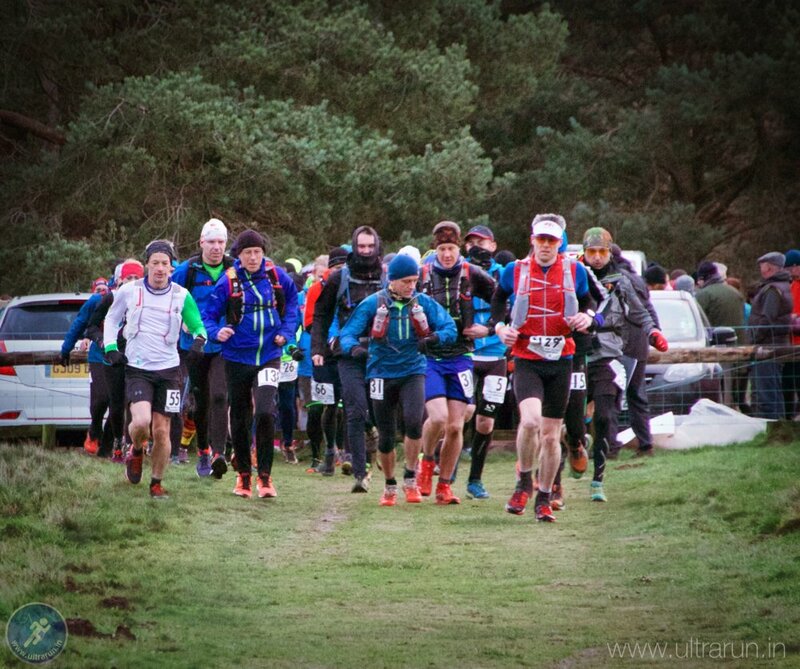 This is a superbly run event and a brilliant way to test out early season form and fitness along a cracking course, running through some spectacular scenery. Kevin, Ian and the whole Positive Steps PT Team know how to put an awesome race on and their support throughout means a lot to all competitors and once again I thank you all for your efforts. 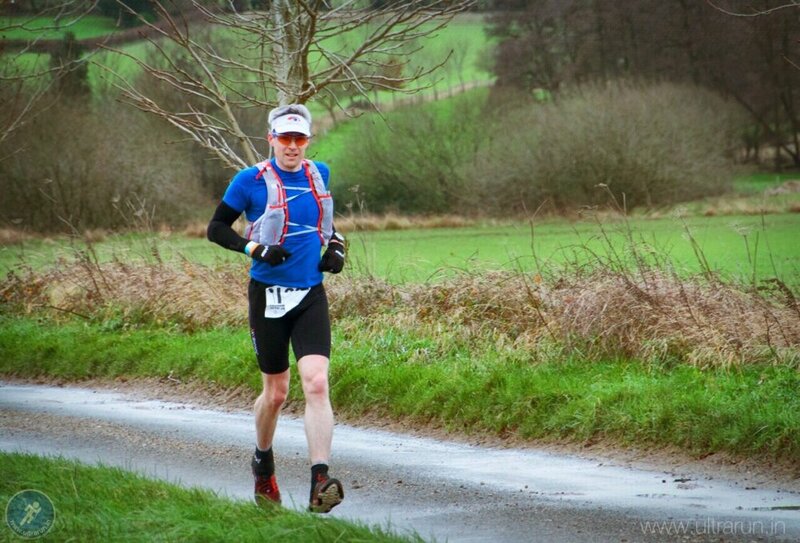 Through this blog and my completion of the grand slam last year, a lot of people now recognise me and encouraged me by name throughout the race. Again this was hugely appreciated, along with your kind words about my writing and photography. Apologies to those whose name I didn’t know in return! Finally thanks as ever for your patience in reading my ramblings about this race. A different year weather wise but it still threw up some interesting challenges for me and hopefully at least one or two of you will find my ramblings useful. 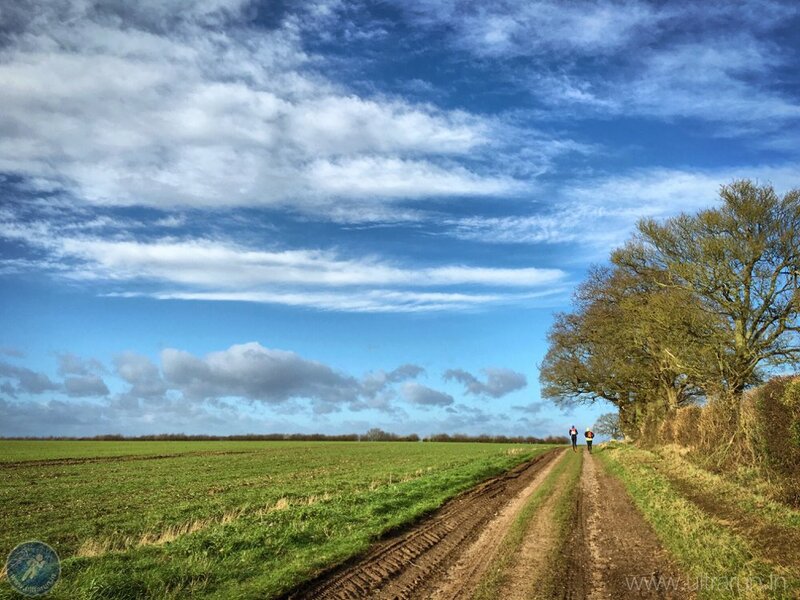 If you’re looking for a nice early season ultra or even one as your first step on the ultra journey, then I can highly recommend The Peddars Way Ultra. I for one know I will be back in the years to come! That’s it! What now follows are the lessons I feel I learned from the race, the kit and nutrition I used and also the race route and statistics. If you’re interested in any of those then read on. If not, then thanks once again and you are officially excused! Adopting a racing attitude made me far more efficient through checkpoints, spending only 15:30 minutes in them across the entire race. I MUST find a way to banish mental demons when they arrive to attempt to scupper my race. Consider liquid nutrition as a way to get calories in when you are pushing harder in races. Montane windproof gillet, although I removed this after about 7km and carried it to the end. First aid kit – antiseptic wipes, blister plasters, vaseline, dressing and zinc tape. The route is stated as being 47 miles, however with the extension at the start and the finish I recorded the total race distance as 78.15 kilometres or 48.85 miles. Pace wise, I averaged 5:52 per kilometre across the entire course, which is obviously up on the 6:30 I was aiming for to give me an 8:20 finish. My average heart rate was also higher than normal at 143bpm. You can view the detailed data and route from the race on my Strava profile. Alternatively for for a more accurate set of readings, try the same race data on my Movescount page. Finally for those that want to experience the race from a runners perspective, Chris Moss put together the following video from the 2016 race which you might enjoy. Great job Chris! Your reviews and race commentaries make very interesting and useful reading. I’ve done a few marathons and thinking of dipping my toe into ultra waters. I’m 47 and thinking of building up to 50 miles at 50? The detail you go into is really useful as are the insights in the mental and nutritional aspects. Many thanks. Glad you enjoyed them and 50 at 50 sounds like a great challenge. If you’ve done a few marathons then you should have no trouble building up to that over the next few years, subject to personal health and injuries of course. 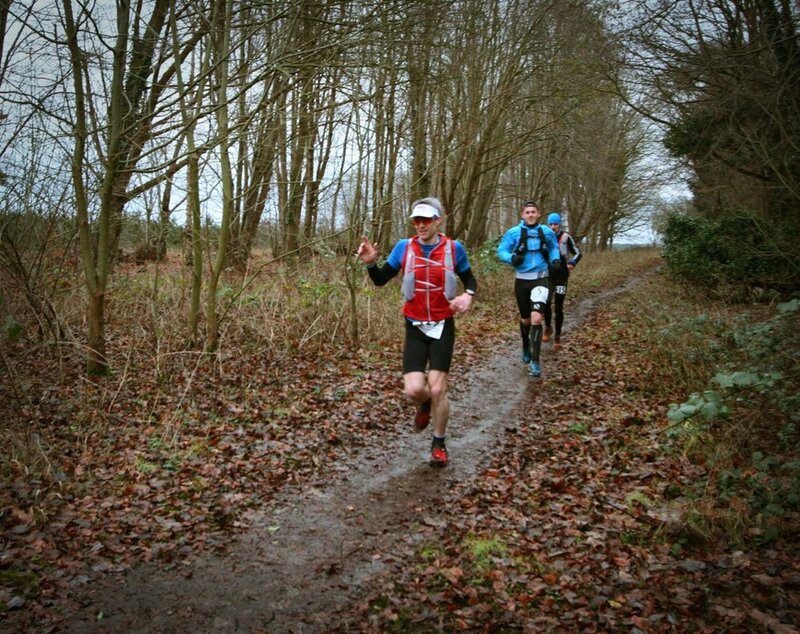 I can highly recommend both the Kings Forest 50km and Grimreaper 40 mile as first races. The lapped courses make them really easy to manage pacing wise and the ability to chop and change kit and nutrition at the end of each lap could also be useful. I’ve done both, so you will find detailed reports of each in the race reports section of the site, if you haven’t already. Good luck with your challenge and enjoy the journey!